Commercial quality beer bottle caps to keep your brew safe and sound from bottling day until you're ready to enjoy it. 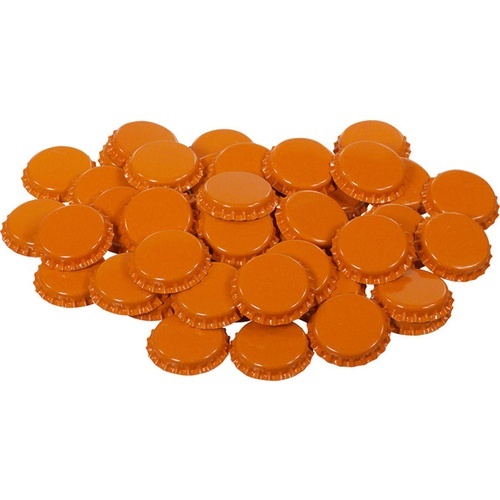 You will get a good firm seal that will last through transport, gift giving, and storage with these orange bottle caps. These bottle caps crimp down onto the beer bottle and make a firm seal. They don’t rust or leak and they contain an Oxygen absorbing agent in the liner, which means you won’t get any unwanted oxidation. A good value for a great product. Use Orange caps for Octoberfest. Caps of a different color. Standard bottle caps, like the color. These caps are flatter than others purchased here. They were tricky to center and we managed, we wasted quite a few. Maybe not as shiny as pictured, but really great!